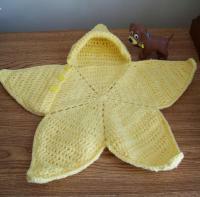 I came up with this star bunting after seeing a knit version at Lion Brand so this is a directly inspired design. 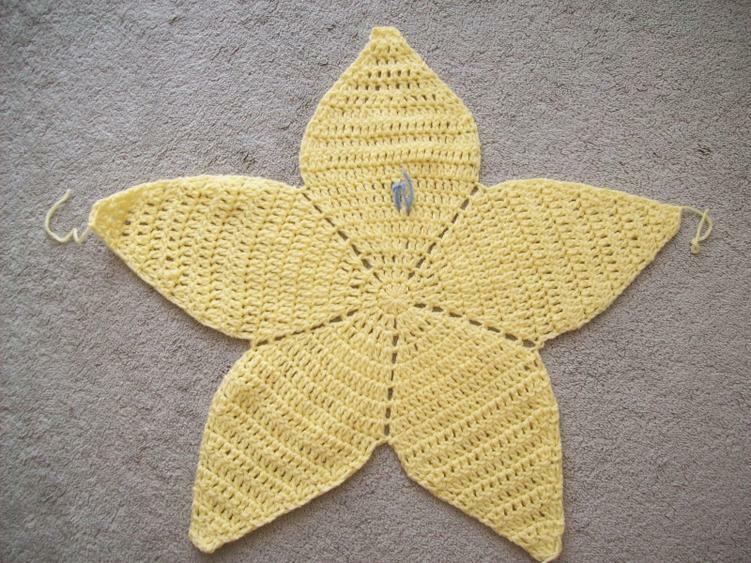 They have a crochet version but I have no idea what it is like because they don’t have a picture of it. Row 3: Ch 4, 2dc in next dc, dc in next 2 dc, 2dc in next dc, ch 1* repeat to end allowing for pattern notes. Row 4: ch 4, 2dc in next dc, dc in next, 2 dc in next 2, dc in next, 2dc in next, ch 1* repeat to end allowing for pattern notes. Row 5: ch 4, * 2dc in next dc, dc in next 2, 2dc in next, dc in 2, 2dc in next, dc in 2, 2dc in next dc, ch 1* repeat to end allowing for pattern notes. Row 6: ch 4, * 2dc in next, dc in 12, 2dc in next 2, ch 1* repeat to end allowing for pattern notes. Row 7: ch 4, * 2dc in next, dc in 14, 2dc in next 2, ch 1* repeat to end allowing for pattern notes. Row 8: ch 4, * 2dc in next, dc in 16, 2dc in next 2, ch 1* repeat to end allowing for pattern notes. Break off and tidy all ends. Lay the pent with a flat side at the top and put a marker there just to keep yourself oriented. On each of the 4 sides ( not the marked side) work as follows..
Work 2 rows evenly across the edge. Work one decrease on each side until you have 4 sts. … dc in 1st, dc dec, dc in last break off. Repeat this for the other 3 non- marked edges. Att yarn in end st.
Row3-5, dc in 1st, dc dec in next, dc to last 3 sts, dc dec, dc in last. Row 6: dc in 1st, dc dec in next, dc in 3, dc dec, dc in 4, dc dec, dc in 3, dc dec, dc in last. Row 8 – 11: continue as with other points. Mark your upper flat edge just to keep yourself oriented properly. Work the two lower edges and the edge immediately to the right (as viewed) of your marked edge as you did the same points on the back pentagon. Work the remaining rows as you did for the other ‘points’. Row 4-6: work as row 3 with on extra dec in the middle. Row 7: work as row 3 but make 2 dec in the middle. Row 8: work as row 4. Continue as for other points. Break off and tidy all ends. 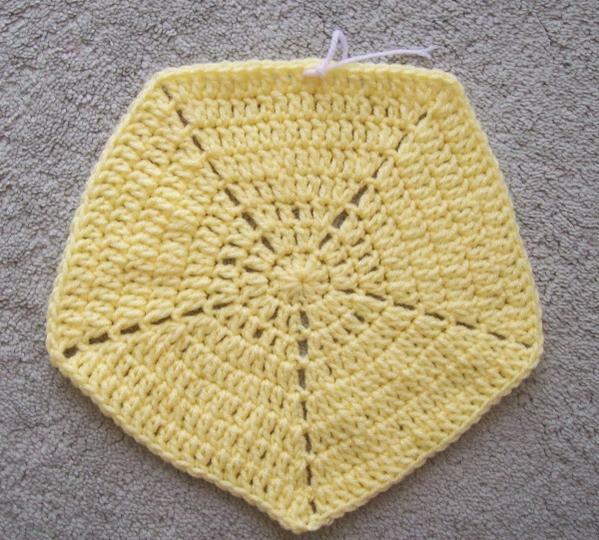 I want to be able to put an edging row on the ‘hat’ portion so I am going to begin joining at the right side (as viewed) edge of the hat so that I will end up at that point. I’m using sc for the edging because I want the emphasis that it provides. For each point.. work 3 hdc in the centre dcs to form a nice point. 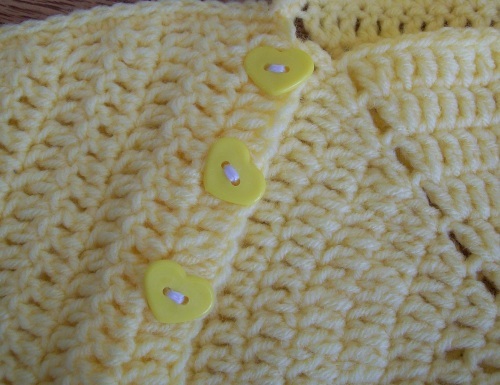 Align the loose arm piece with the adjoining back portion and join with sc. Continue by adding the front portion and working around the other points joining all with sc as established. When you get back to the start, turn your suit so that you can work a Crab st. across the ‘hat’ edge. 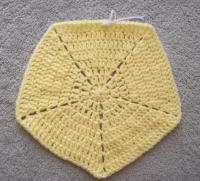 Crab st or reverse single crochet instructions can be found on You Tube. Add buttons to the opening edge. I did not make buttonholes as the dc fabric allowed my buttons to go through naturally. I will stop by occasionally to see if there are problems or concerns about the pattern. I always worry about how things get said in patterns. Darski, that is the cutest thing! Thank you for sharing your pattern. And it's good to 'see' you, I've missed you! Darski, I've seen the knit one you refer to. And This is adorable!! I will have to add this to my list of WIM's right away. for your kind words. 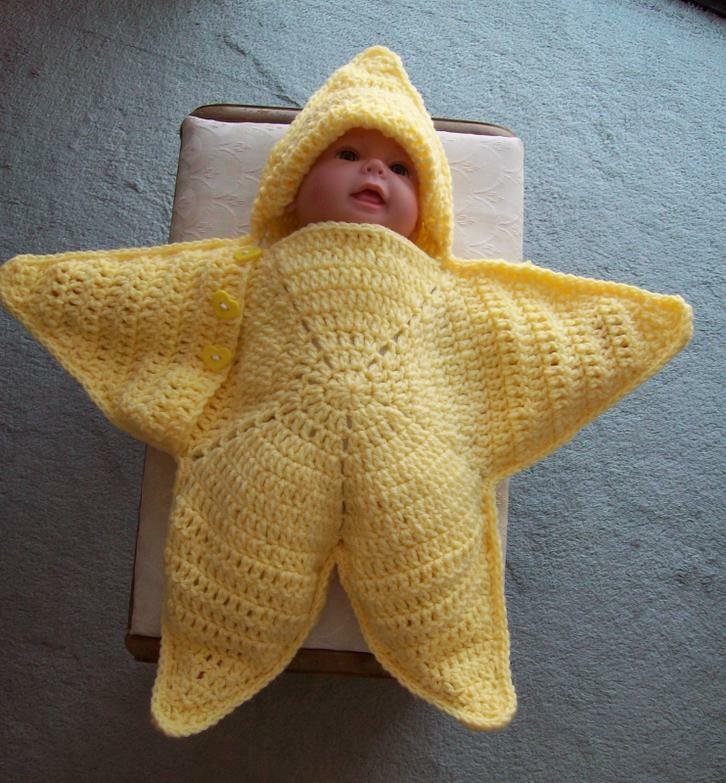 I do think this would be easy to adapt for a real baby. Once you know the technique, size isn't important. Very cute! Missed seeing you around here, glad you are back! It looks so definitly cool!! Oh that is so cute!!!!! I have got to make one of those!!!!! Wow! The Lion Brand knitted version can't hold a candle to the one you did. I absolutely think yours is GORGEOUS. Thank you for sharing. 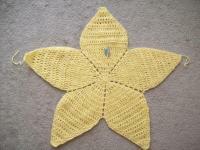 Nopw this is great and I am going to make it just as soon as I get finished the other 20 or so projects "I.m gonna make"
I just wanted to add that a friend of mine made one of these for a really baby and it was so cute. she used a minty green baby yarn doubled. 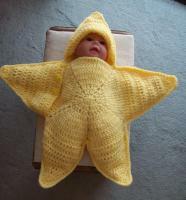 Will try to get a pic when the baby wears it. It does work for a real baby and not just my adorable little guy. Darski, it is very cute! thank you for posting it. Love the photos! I'm doing a doll blanket charity project, might have to do one of these! This sure brought a smile to my face. It is just adorable. That is just too cute! Thanks for sharing it!